Puri is a very popular deep fried Indian flat bread mostly taken for breakfast. It can be made plain or with many variations. Spinach is loaded with nutrients and I like adding it to most of my dishes. 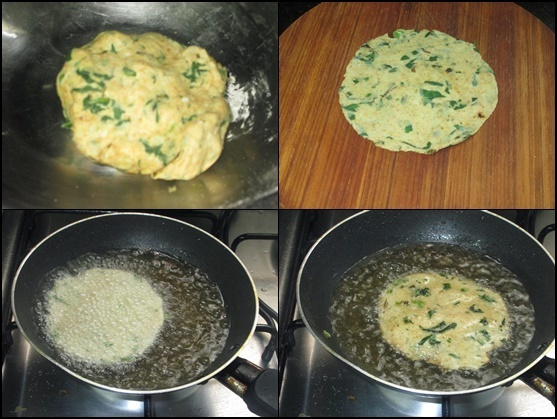 I have sauteed the spinach lightly and added to the puri dough. You may just use whole wheat flour or mix some maida or any other flour. These delicious puris can be had without any accompaniment too.. just with curd and pickle or even munch them with masala chai. 1. In a pan heat one tbsp. oil and add garlic paste. 2. Saute and add the chopped spinach, kasoori methi and green chillies. 3. Add salt to taste and crushed cumin seeds. Stir for a minute. 4. In a bowl take the flour and add the prepared spinach. 5. Check the salt and add a little if needed. 6. Mix it well and knead the dough adding little water or curd. 7. Roll out small puris and deep fry them. Thanks .. and yes nice way to make everyone eat the greens.